Alpha Phi Omega is excited to share this digital archive of the Torch & Trefoil magazine, the official quarterly publication of the Fraternity. Originally named The Lightbearer, APO launched the first official issue in 1927 with nationwide chapter distribution. The publication was renamed Torch & Trefoil in 1935 and has carried on for many years under that title, and it will continue to do so for the decades to come. Torch & Trefoil has gone through a great deal of change over time. One thing that has never changed is the Fraternity’s dedication to providing content which covers a range of material important to all brothers. The magazine includes information on programming, chapter news and events, fraternal issues and achievements as well as all other matters pertaining to the growth and evolution of APO as the nation’s largest Greek-letter fraternity. 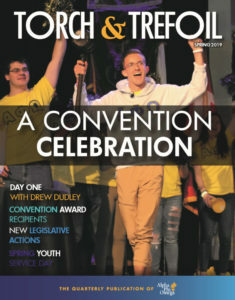 Any changes made within Torch & Trefoil are done with the hope of helping meet the evolving needs of APO members. Please enjoy this site as a part of the Fraternity’s living history. Feel free to contact publications@apo.org with comments or questions regarding the magazine.